ArT Wine Preserver is the easiest way to keep wine fresh. Stop using complicated vacuum stoppers or throwing away oxidized wine. Our system utilizes 100% pure, food-grade argon that keeps oxygen out of opened wine bottles. ArT is the perfect solution for wine drinkers who want to enjoy their favorite beverage by the glass. It's easier to use than vacuum products and allows you to keep opened wine in the refrigerator for up to weeks at a time. Any wine connoisseur can benefit from ArT Wine Preserver. Because reinserting corks can allow excess oxygen to get into wine bottles, we suggest using ArT Wine Preserver in conjunction with our universal wine bottle stoppers. Our 1-can pack includes 1 stopper, our 3-pack includes 3 stoppers, and our 4-pack includes 1 stopper. With our wine preserving kits, you can keep your wine in the fridge for up to 3 times longer without worrying about oxidation ruining your favorite wine. As an inert gas, argon is very effective at displacing oxygen in an open bottle of wine, helping it taste and look its best. Simply spray the can into your open bottle of spirits for 2 seconds, insert the stopper, and refrigerate. Re-spray each time you open the bottle. Even home winemakers can benefit from our product during fermentation. Wines have different oxidation times depending on the variety, but ArT can extend the life of any opened bottle of wine. Whether you prefer to drink red, white, or fortified wines, this product is a great way to enjoy a few glasses throughout the week. It also works well for various wines you use in cocktails, so you can preserve leftovers. Enjoy more, waste less with ArT Wine Preserver. ENJOY MORE, WASTE LESS: Are you looking for a quick, simple way to keep your wine fresh after opening? ArT is the perfect solution for wine drinkers who want to enjoy their favorite alcohol by the glass. Our argon spray is easier to use than vacuum products and allows you to keep opened wine in the refrigerator for up to weeks at a time. Any wine connoisseur can benefit from ArT Wine Preserver. WORKS FOR RED & WHITE WINES: Wines have different oxidation times depending on the variety, but ArT can extend the life of any opened bottle of wine by displacing oxygen. Whether you prefer to drink red, white, or fortified wines, this product is a great way to enjoy a few glasses throughout the week. It also works great for various wines you use in cocktails, so you can preserve leftovers. UNIVERSAL WINE STOPPER INCLUDED: Reinserting corks can allow excess oxygen to get into wine bottles, so we suggest using ArT wine stoppers after adding the wine preserver. Our 1-can pack includes 1 stopper, our 3-pack includes 3 stoppers, and our 4-pack includes 1 stopper. With our wine-preserving kits, you can keep your wine in the fridge up to 3 times longer. MAKES A GREAT GIFT: Oenophilia is defined as a love of wine, and we all know the wine lover who's always looking for new wine-preserving technology! The ArT Wine Preserver set is a great wedding anniversary, birthday, or Valentine's Day. Whether you give our set to your spouse or a coworker, it's a great way to show women and men in your life that you care. 100% FOOD-GRADE ARGON: As an inert gas, argon is very effective at displacing oxygen in an open bottle of wine, keeping it tasting and looking its best. Simply spray the can into an open bottle for 2 seconds, insert the stopper, and refrigerate. Re-spray each time you open the bottle. Even home winemakers can benefit from our product during fermentation. It's the easiest way to keep wine fresh! 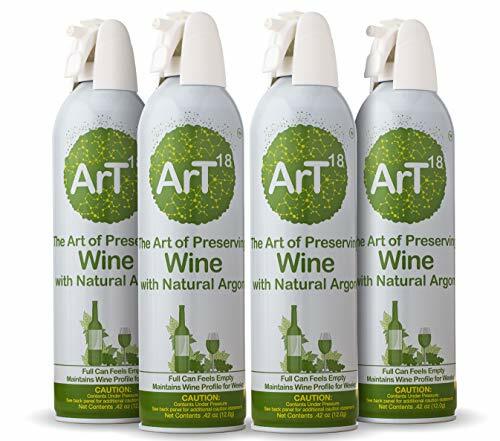 If you have any questions about this product by ArT Wine Preserver, contact us by completing and submitting the form below. If you are looking for a specif part number, please include it with your message.